A hearing is scheduled Dec. 20 on a state Gaming Control Board complaint against a man accused of cheating at gambling. The Nevada Gaming Commission boardroom will seem more like a courtroom, a commission hearing like a trial, and commissioners like judges and jurors next month. A hearing is scheduled for Dec. 20 on a state Gaming Control Board complaint against a man accused of cheating at gambling. Hearings like the one scheduled for Jeffrey Martin don’t happen very often. Martin was one of four men convicted of theft and cheating at gambling in 2016 in Clark County District Court and sentenced to prison. 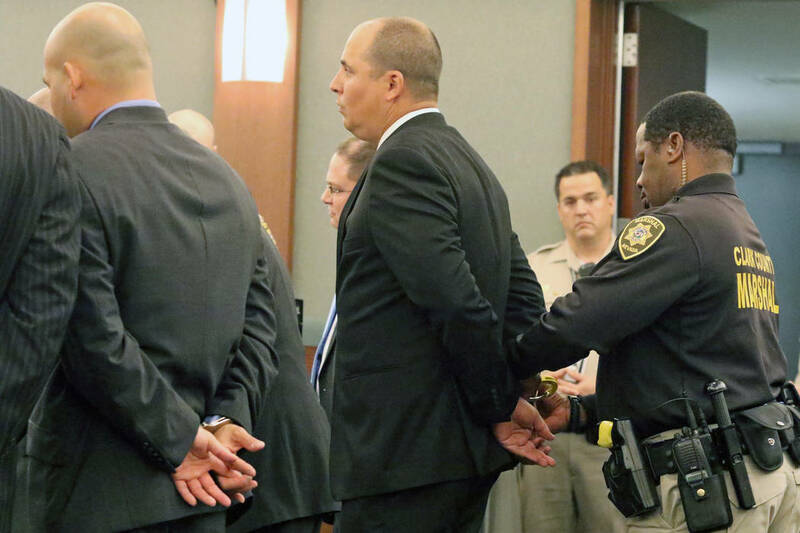 The group’s ringleader, former Bellagio craps dealer Mark Branco, remains incarcerated after being sentenced to four to 10 years in prison. The others — Martin, Anthony Grant Granito and James Russell Cooper — received lighter sentences and eventually were placed on probation. This month the Gaming Commission made Granito and Cooper the 33rd and 34th people placed on the state’s list of excluded persons, known as the Black Book. If you’re on the list, casinos statewide are directed to keep you out and can call law enforcement if you appear. Granito and Cooper were added to the list in a meeting similar to dozens that have occurred before. The three-member Control Board issues a complaint. The attorney general’s office explains the complaint to commissioners. Questions are asked about whether nominees were properly notified, and then the commission votes unanimously to add them to the list. It’s expected to be different next month. According to Nevada Revised Statutes and the board’s Regulation 28, Black Book nominees are given the opportunity for a hearing, and Martin chose to have one. Gaming Commission Chairman Tony Alamo will preside, and his four commission colleagues — two men and two women — will hear the evidence and vote. Testimony probably will be similar to what was presented on Granito and Cooper. According to Cooper’s own grand jury testimony, he and Branco would have to be working the same table. As a craps shooter tossed the dice, Granito or Martin would mumble something that sounded like a “hop bet” — a wager that specific numbers would come up on the next roll — and one of the dealers would pay out as if they had correctly wagered on whatever fell. At the time, the felt on the Bellagio craps tables had no designated spot for such bets. Investigators who reviewed hours of surveillance video from play between August 2012 and July 2014 said the team defied 452 billion-to-1 odds to win an estimated $1.2 million over time. The team was difficult to detect because they deliberately lost some of the time to deflect attention. Their reluctance to use comps on shows, steak dinners, free rooms or a day at a spa they had won for their play might have led to their discovery. Alamo said he has not conducted such a hearing since he was appointed chairman in July 2014. It will be just like a jury trial. The Control Board, through the attorney general’s office, will present evidence, exhibits and testimony. The nominee, who is allowed to have legal counsel, can rebut the evidence. Then the process is reversed, and the nominee presents a case for not being added to the list. Unlike a jury trial, commissioners are allowed to ask questions through the process. Once both sides have presented their cases — a process outlined in the Control Board’s Regulation 7 on disciplinary proceedings — the commission deliberates and votes. As in any courtroom drama, anything could happen. An adjudicatory hearing by the Massachusetts Gaming Commission regarding Wynn Resorts Ltd.’s licensing there is on hold for now. The commission is awaiting the outcome of Steve Wynn’s lawsuit against the commission, investigator Karen Wells and his former company, Wynn Resorts, for allegedly disclosing privileged attorney-client communications. Clark County District Court Judge Elizabeth Gonzalez temporarily blocked the release of the commission’s report about allegations of sexual misconduct against Steve Wynn, charges he adamantly denies. As of late last week, no hearing date had been set. At stake is the licensing of Wynn Resorts in that state and the June opening of the $2.5 billion Encore Boston Harbor. The report is expected to address how much current company executives knew about the allegations against Steve Wynn and whether that is enough to disqualify the company as a licensee. But Massachusetts can’t have their own hearing about that until the attorney-client matter is resolved. Massachusetts is arguing that a Nevada judge lacks jurisdiction to decide on that state’s gaming policy.